Enter your info to be notified first. 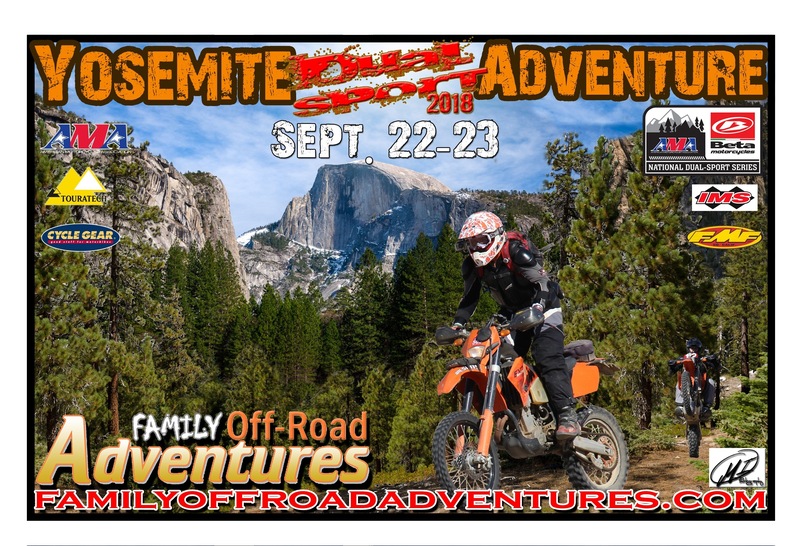 ​The Yosemite Dual Sport Adventure is an AMA Sanctioned dual sport event held at the gateway to Yosemite National Park in Buck Meadows. This event is open to any make or model of street legal motorcycle. This two day, GPS based, self-guided adventure includes scenic & historic destinations both in and around Yosemite National Park and the Stanislaus National Forest. Using paved and unpaved roads, sometimes with "hard" & "easy" split options, you’ll have approximately 100 miles of fun each day! "Easy" routes are perfect for beginners or large adventure bikes. Experienced riders can be challenged by choosing "hard" splits if available. We do our best to include as many miles of dirt as possible. FREE GPS Training: There will be a FREE class on how to navigate with GPS while riding in the back-country. With or without trails, roads, land-marks or a paper map you'll be able to confidently navigate anywhere on the planet once you know the ropes. Bring your GPS pre-loaded with our routes, something to take notes on and an open mind. This class will be at 6:30pm on Friday at the registration tent. Destination and routes are only our recommendations. The Yosemite area has SO MUCH to offer that we hesitate to limit your experience. GPS downloads are an accurate representation of the route and include waypoints at various locations of historical significance and scenic beauty. A reference map showing suggested destinations, routes and bailouts is handed out during registration. I registered a little late, can I get the gps files when I get there? Chad, You can always get the files when you arrive. How are the fires affecting this ride on Sept 2018? Since the event is still about 2 months away we can don’t expect this fire to have any bearing on the September event. The fire is also not in the places that we ride. Thank you. Great news. I am counting down the days to hit the road to this ride. I’m going to buy a dual sport so I can do this, (and other events to follow). Any recommendations on the right size bike for the trip? Is a Honda 250L too small? Is an Africa Twin too heavy? I get asked this all the time and by far the best bike to get is the one that you LOVE TO RIDE! The smallest bike we’ve had was a 100cc Honda XR100 (with a plate!) ridden by a 5-foot-nothing woman that came with her family. The biggest bike was a Harley pulling a trailer (no kidding!). My point is that there is no bike too big or too small to do what you love to do. Find a bike that you like and join the fun! besides, I think that if you talk to anyone that ‘s ridden for a long time they will tell you there there is no “perfect” bike, that’s why most people that ride own a few of them! You are 100% correct. Helping someone choose their right bike is tough. Ride what you think you will be comfortable on is the best advice. And there is no perfect bike for everything. Hey Lawrence, that fire continues to burn with lots of smoke issues in and around Buck Meadows. I’m signing up now, if, and that’s a big IF, you had to cancel, would we ride another location, ride another date or refund? Bryan, A few years ago we had to cancel the ride due to the Rim Fire. When that happened we offered a refund to anyone that wanted one. Most people opted to just push their entry to the next event and rode with us on the May ride. That is what we would do again if needed. Right now the event is about a month away, the Ferguson Fire is over 80% contained and it mostly burned in areas that we don’t ride anyway. We’ll know more as we get closer but I think we’ll be ok for this September. Wow, this event looks amazing. Quick question: my son will have his M1 permit by the event date, would he be allowed to enter? He is a skilled rider with a street legal dual sport and I am confident he is ready for this ride, just wanted to make sure he would be allowed to ride without his permanent CA motorcycle license. Thanks! Rob, my son had his permit for only a couple days before I took him on the Sheet Iron ride. As far as I know you should be fine but please check with DMV for the final answer. As long as he’s legal in California then he will be fine to ride this event. Two riders will be riding plated KTMs and the other rider will be on a KLR. Will the KLR be able to ride on the DS route??? Thanks! As far as I know a KLR comes with a license plate already on it. I am attending Yosemite Duel Sport Adventure Sept. 22 and 23, 2018. I have a truck with room for another bike. I will be leaving from the SoCal Inland Empire area Sept. 21 and returning Sept. 24. If someone is interested in sharing the ride and expenses contact me. Thanks for asking! We typically email out the GPS files a couple days before the event. The dual sport calender has this event date listed as 9/28-9/29. You have it as 9/21-9/22. What are the dates? Greg, Thanks for touching base. The correct date is September 21st & 22nd, 2019. We hope to see you there!